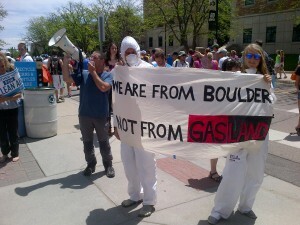 Anti-fracking activists in Boulder, Colo., during a recent protest. Photo by Kari Lydersen. The Illinois legislature passed a bill the last week of May that would regulate fracking, the controversial practice for getting natural gas and oil by injecting water and chemicals into shale formations. The bill is being called the strictest package of fracking regulations in the nation. But many people disagree with it. That’s because they think there should be a moratorium or ban on fracking. The bill will become law if Gov. Pat Quinn signs it. Right now there is no fracking in Illinois. But if the bill passes, fracking is expected to start. The bill does have some safeguards but critics say that fracking can never be safe. Industry, of course, is all for the fracking in Illinois. They say it will bring jobs and needed energy. But concerned activists like Annette McMichael and Beverly Walter disagree with the idea of fracking because they are worried it will cause serious pollution of our drinking water and air. They are backing a proposed bill that would put a moratorium on fracking, which would mean no fracking for the next two years, while more studies are done. That bill was introduced in the state General Assembly by state Senator Mattie Hunter (D-Chicago). McMichael is a member of Southern Illinoisans Against Fracturing Our Environment (SAFE). She has had personal encounters with industry representatives near her home. Illinois no longer has a death penalty. It has joined the ranks of the other 15 states in the nation which have abolished executions of convicted people. The General Assembly passed SB-3539 to repeal the death penalty on January 11, 2011. 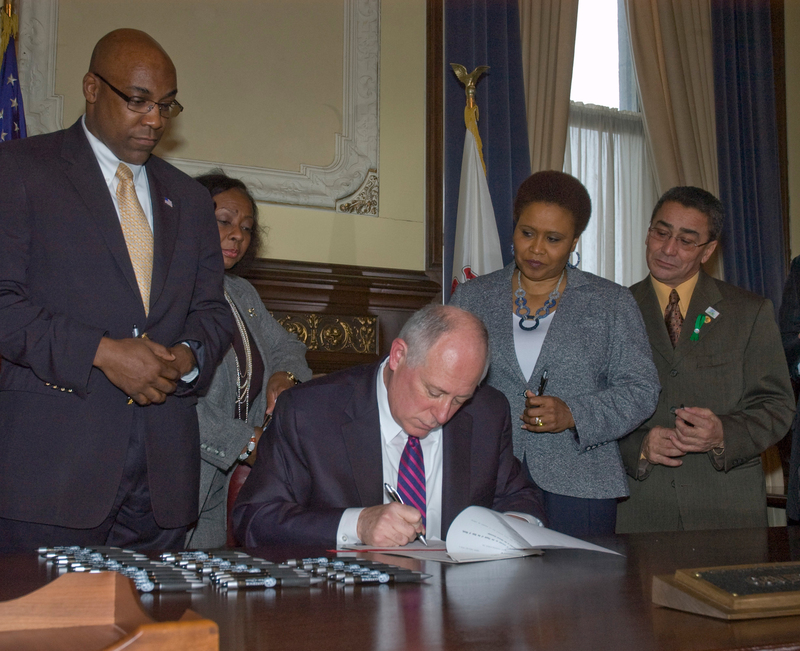 Governor Pat Quinn did not immediately announce that he would sign the bill, but he said he would end executions in Illinois after receiving roughly 12,000 phones calls from activists, members of organizations that opposed the death penalty, and various world leaders such as Cardinal Francis George and Archbishop Desmond Tutu.